It was February 1, 2002 at 5:00 AM Pacific Time. The rain just stopped and the temperature was just a little above freezing. With me was my wife, Jing, and our 11 month old daughter, Hiel. Coming from a tropical country to rainy and chilly Seattle weather was quite an adjustment for us. However, it was the warmth of the people at Community Bible Fellowship that helped us adjust to the weather, culture, and homesickness. God used the Febias College of Bible and the Ateneo de Manila University to equip me for the ministry. 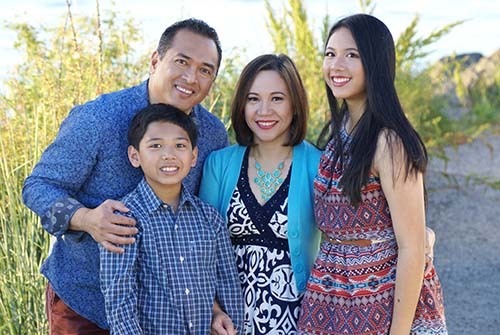 After serving God for more than 8 years in two churches (Sambahang Kristiano sa Canumay and Capital City Alliance Church), and as adjunct Marriage and Family Counselor at the Back to the Bible Counseling Center in the Philippines He opened a new door for us to serve Him in a far away land. The Community Bible Fellowship, a multicultural church in Lynnwood, WA has invited us to come to be a part of the church’s leadership team. In 2007 I served as the interim senior pastor of the church and was installed as the church’s senior pastor a year after that. In 2011, Pastor Sente led the congregation through the process of selecting a new name which held to our core value and better reflected our commitment to spreading the Lord’s word to everyone and our multi-cultural congregation. Our family used to love outdoor activities like hiking, biking, and camping until my wife, Jing acquired allergies from grass, trees, and flowers. We also used to love eating Kare-kare, a Filipino food that requires peanut butter in its ingredients until we found out that Jireh, our son is allergic to all kinds of nuts especially peanut. BTW, did I mention that we have a son? Well, in August 19, 2006 God blessed us with another child, a son named Jireh. So what do we love to do as a family now with all these kinds of allergies bugging us? We love spending time watching movies at home together and entertaining friends in our house. We also love to drive around Washington State until we’re out of gas. Oh, before I forget, the Seafood City in Southcenter Mall is now our favorite place to eat and do grocery. •Though Canada is just 2 hours away from their house they still haven’t crossed the border yet. •Pets are not allowed in their house except for their 2 Calico fish named Fred and Becca. •They love real indoor plants but don’t know how to keep them alive. •Most of the times Pastor needs to explain his jokes to his children if he wants them to laugh. •Pastor’s real first name is Romualdo (pronounced: rome + waldo). He was given a nickname ”Doods” (not “Dude”) by his seminary friends because they don’t want to call him “Bebot” which is his real nickname because it is a Tagalog slang word for a “hot babe”.